Your reception site will create wedding day magic for you! 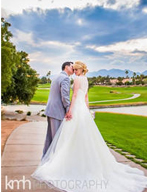 Las Vegas country clubs and banquet facilities are a perfect choice for your wedding reception. There are many to choose from, each with their own ambiance, special features, and spectacular views. Whether you are looking for a chapel wedding, banquet hall, or some place that does it all, these Las Vegas wedding venues are a great place to start. See the venues listed below and visit their websites or check our the Venue Review Section of Spectacular Bride to find out more. 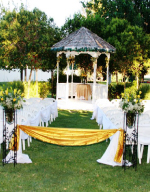 A private country club on 10 lush acres with indoor and outdoor ceremonies and receptions. Unsurpassed ambiance and evening lighting. 9 packages to choose from, click here for rates on packages. We've come up with some great ways to ensure your wedding is unforgettable. Plan your special day at Aliante and enjoy everything we have to offer. Located at 215 at Aliante Parkway. At Arizona Charlie's, we love love, and want to help you celebrate it in any form. As an off-the-strip hidden gem, we offer several great options for ceremony, reception, or both. For a more intimate affair, Ron’s Steakhouse will delight you and your guests. For larger events, Diamond Mae’s Ballroom is perfect for you. .
Bears Best opened in November 2001, offering spectacular views of the Las Vegas skyline. Situated 1,000 feet above the strip in the exclusive Summerlin community, The Ridges. Bears Best is a perfect setting for your special day. Choose from an indoor or outdoor pavilion and a variety of menu options. Kampai! Join your futures & family by celebrating your unforgettable wedding at Benihana Fashion Show. enjoy your unique day with the backdrop of the Las Vegas setting sun from our outside ceremony area. Our foundation is a flair for something different while creating forever memories. Build your new beginning with us! 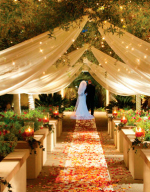 Where your wedding vision can come true! The Canyon Gate grand ballroom is enclosed with twenty-five foot glass windows, marble pillars, and an expansive balcony overlooking the beautifully manicured golf course and Red Rock Mountains. 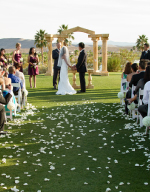 Allow Canyon Gates's event coordinators help you with the day you have been waiting for. Emerald at Queensridge....where romance meets elegance in splendid style! 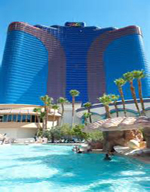 Emerald at Queensridge is Las Vegas' premiere wedding and banquet facility! Located in the prestigious northwest part of town, our lush landscaping, spectacular mountain views and dramatic sunsets make our setting like no other.